Its really mind-blowing to see such pics on the Oric these days .. I know there are tricks involved, but even then, if these tricks'd made it out there in the general 83/84 period, there would probably have been a bit more interest. I'm not sure the color-clash can be exploited this way on ZX Spectrum attribs, or am I totally wrong? Anyway, I'd love to explore ways these techniques can be used to make more ethereal animation/game art.. 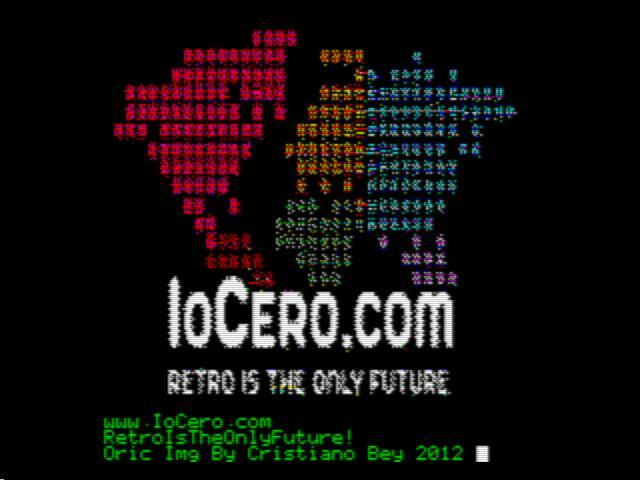 It's very nice pict for the Oric. How did you managed to make them? ibisum wrote: I'm not sure the color-clash can be exploited this way on ZX Spectrum attribs, or am I totally wrong? Its not possible on Spectrum by default. The Spectrum attribute system allows 1 foreground (ink) and 1 background (paper) colour for every 8x8 pixel block of the screen. There are 7 colours in the palette plus black. For each 8x8 pixel block, there is also a 'bright' and 'flash' attribute. The bright attribute will affect both foreground and background colours with the exception of black which only has one shade (there's not a 'bright black' to give grey), so there are effectively 14 colours plus black to play with. As the bright attribute affects the whole 8x8 pixels, you can't have a bright foreground colour and a 'normal' background colour. The big benefit of the Spectrum attribute system over the Oric's is that you don't need to reserve a whole byte in advance for a colour change - you can contain graphic pixel data as well as a colour change. On the Oric, changing colours prevents any graphic pixel data for the 6 pixels in that cell (unless you're inverting colours, which in itself is tricky since it inverts both foreground and background colours). Personally I prefer the Spectrum attribute system, but the Oric does at least treat it's screen memory in a linear fashion. The Spectrum has 3 (iirc) chunks of screen that are stored in a rather odd fashion. You can see this on any Spectrum game that shows its loading screen build up as it loads, with the lines not filling in from top to bottom but instead doing a one line for each character block of its memory section, then the next line, then when that's complete it moves down to the next section of screen. Very odd, but I'm sure there was a reason for it being done that way. Spocky wrote: It's very nice pict for the Oric. My god, this pipi makes Oric shine like an Atari ST! Just some experiments with pipi. I have created a "simple" demo disk image for a recent Turkish "retro" meeting called "retrojen" last week. In that meeting, there will be an Oric with cumulus hardware so I was planning to run that demo disk on real Oric with cumulus. But unfortunately, I could not attend that meeting due to public riot against recent actions of prime ministers of Turkey -maybe you heard something about it- . Instead, I want to share those pictures and disc here. I've created those pics mostly with pipi. I've attached the disc image to this message. Wow peacer those look incredible .. I can't wait to see them on a real Oric! I'll wire up my system this weekend and try them out, just because of your incredible pictures! If we'd had this in the 80's, the Oric would've rocked a lot of boats! I have a big enthusiasm to remake those "other platform" games like defender of the crown on Oric. Such great conversion utilities make it easier really. As it is discussed under another topic, a more talented PC---> Oric picture adaption software with picture editing capabilities with mouse is still needed anyway.